In late October 2018, I returned to Latin America & Mexico with the Spanish and Portuguese translation of my book, The Love of a Master, revisiting many of the places I traveled to last summer. This time, I started off in Mexico City, staying again at the home of Graciela, one of my favorite places. A new president had recently been elected and there was a lot of construction at the airport. They shut down the entire water system of Mexico City, so a lot of people left. Some residences, like Graciela’s, did have access to water, but many didn’t. This was a good opportunity for me to just hold with ministers and enjoy Mexico. Martha Soto and Marco Mejia were also with me as we presented a John-Roger Video Marathon and my new Love of the Master Workshop—a one-day immersion in J-R videos and sharing, based on my book and experiences. I think about 6 or 10 people showed up because we were there just holding the Light. My next stop was Colombia. 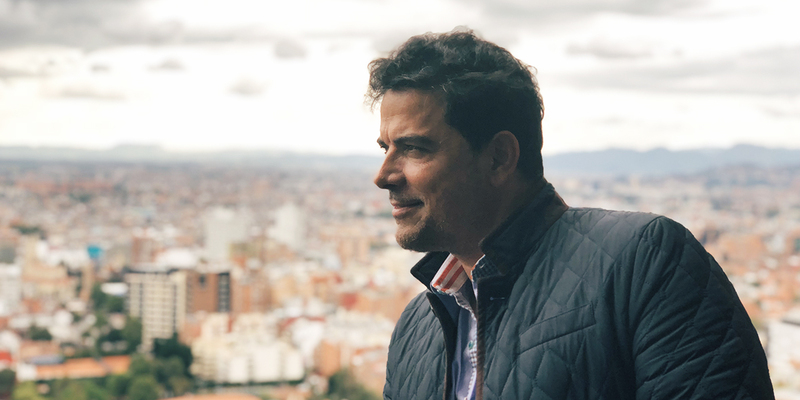 I stopped in Bogotá long enough to connect with Ilse and Alberto Arango and Diego and Juliana Forero. I then traveled with them to La Calera, a beautiful mountain town about 11 miles (18km) away. At nearly 9,000 feet (2,718m) elevation, I had a really hard time breathing, since I am prone to altitude sickness. Thanks to Pablo Lipnizky, who works at the Ekirayá Montessori School of Education, we were able to set up in a large classroom on the campus. It was a fantastic experience. We showed some great J-R videos that the locals hadn’t seen, because they were newly subtitled in Spanish; I also subtitled Journey to the East. Participants enjoyed a very full couple of days in the workshop format watching J-R videos and doing some sharing. Melba Alhonte in New York had sent several new people to us, who got a huge dose of the love that was in the room. One new lady shared that the videos and information about John-Roger were great, but what really got her going was the love she felt in the room for J-R. I guess J-R did his job from the other side, because everybody in the room shared about J-R, their Master and teacher, as well as John Morton, which is what the new people wanted to hear. That was very good feedback to learn how important it is to talk and do some sharing, along with the J-R Videos, because when two or more gathered in that way, it really gets the energy going. And then we were off to perform initiations in various places—starting with Chile! I stayed at Réymi Urrich’s place in Santiago, Chile. Vania Grimalt, Isabella and Pedro also helped. We all went down to the coast, spending time with Ana Maria Corvalán, Mirella Chávez and about ten new folks who were interested in John-Roger seminars/MSIA. As usual, we did a marathon of J-R videos, and sold copies of my book. And really, it became a fantastic setting to just do Satsang and share about J-R and talk about my experience of working with a Master. It’s was like a dream, some other life that you’re talking about, but bringing it present in this moment, not as a memory but right now, and really basking in that energy. We went to Villa del Mar, which is a casino that J-R took me to in the late ’90s…I believe that John was also on that trip. It was a great experience to walk through and recharge the Light columns that J-R left behind. Then we visited Nora Valenzuela’s home in Villa del Mar, which is really beautiful. Next, on the itinerary was Mendoza, Argentina with Eduardo Vera, who holds MSIA seminars three times a week. It was amazing to jump into that structure and discipline! We had two awesome nights of sharing back to back. I think we did three-hour sharings, really cool. Some people were new, some were in the Movement, some were Soul Awareness Discourse subscribers. We also did several initiations there for John. So much Light and love to all of them. Staying at people’s homes gives me more and more of the sense that J-R is everywhere in everyone. And it’s so beautiful. The Traveler works in mysterious ways. John had recently completed his South America trip, so I got a taste of visiting several communities soon after John had left and there’s a LOT of energy. By the time I arrived in Buenos Aires, the G-20 Summit had started, so many world leaders, including Putin, Trump, and President Xi from China, were there. It was perfect timing for me. Even though not many people came to my J-R Marathon or the workshop, I was hosted by Diana Berengue as well as Vania and Isabel who came to support me from Santiago. So, there we were in Buenos Aires holding the Light for the G-20. Very cool—loved it. One night I was invited to hang out with the Insight community, which is really big there. I think the last time I was in Buenos Aires was 2013 with J-R, when we attended the Plata del Mar film festival and brought the Mystical Traveler movie there with Graciela Borges, Kate Kirby and Juan Cruz hosting us. Before that, possibly 1997 or so, was the last time I saw Alex Padilla. And I remember J-R saying “turn on the lights” as Alex was leaving, so everybody in the audience applauded and said goodbye to Alex, not realizing that would be the last time we saw him before he transitioned. And then I went to São Paulo, Brazil, where I was reunited with Vagner Augusto de Souza, who had hosted me in 2008 for the Spiritual Warriors movie debut. This time, I stayed with MSIA’s rep, Adi Riberio, which was really a luxury to be hosted and treated like a star. I sold 48 The Love of a Master books in Portuguese—big shout-out to Adi, thank you so much! I was also able to initiate someone there for John Morton. I really enjoyed my time in South America. Especially because of the gorgeous weather—as the Northern Hemisphere was heading into winter, it was bursting out in spring down there. I’d never seen Santiago de Chile look so lovely, or Mendoza, or Buenos Aires…that name is perfect for the city. It WAS “beautiful air.” And of course, all those reps for MSIA who are good friends of both J-R and John Morton, were simply fantastic and treated me very well. From my point of view, the state of MSIA is doing very well all over the world. The Traveler is connected everywhere, there is no border, there is no limit except what’s in the mind and what people want to believe. But in my experience, my Traveler J-R is powerful everywhere, and this line has continuity with John, the current Traveler, who is working everywhere. He’s beloved and I support him and MSIA and I’m just really glad that I get to see J-R in everyone and everywhere. That’s been my ministry, too. After 26 years of working closely with J-R physically, it’s been very important for me to seek him out and to learn another language, similar to learning Greek. It’s like a completely different inner language, a spiritual language of connecting with that loved one, in particular, my spiritual master, my teacher, my Traveler John-Roger. And where do I go for that? I chant my tone. When two or more are gathered there he is and I can see his presence and feel his presence as I did when I finally flew back to LAX on December 9th. I got a good night’s sleep at home, packed, and hit the road the next day to join up with the start of The Royal Road retreat in Asilomar, to be of assistance to John Morton and Sherie Wylie. Four years earlier, in December 2014, we had spread the ashes of J-R from a boat in the ocean right off the Asilomar beach, which you can see when you take a peek from the conference hall where we do the PAT [Peace Awareness Training] processes. The end of 2018 marked 30 years since I raised my hand at the Sheraton Universal Hotel, during the relationship workshop with Drs. Ron and Mary Hulnick. That day I raised my hand and said I wanted to be like John and serve J-R—and I’ve been blessed to have gotten that wish.